Cool gadget alert! Until now, while doing timed strength moves like plank and wall sits, I've counted the time to myself. Not surprisingly, as much as I try not to, I inevitably speed up the counting when the going gets tough and my muscles start to beg for it to be over. Not so with the new Gymboss Interval Timer. It keeps me honest; if my goal is to do 60 seconds, I do 60 seconds. Period. Until now, while doing timed strength moves like plank and wall sits, I've counted the time to myself. Not surprisingly, as much as I try not to, I inevitably speed up the counting when the going gets tough and my muscles start to beg for it to be over. Not so with the new Gymboss Interval Timer. It keeps me honest; if my goal is to do 60 seconds, I do 60 seconds. Period. This is a really versatile little gadget, and it's a cinch to program. 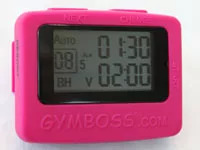 You can set one or two timers, each for anywhere from 2 seconds to 99 minutes—ideal if you're doing repeating intervals and want a few seconds of rest in between without having to reset the timer. The alarm can be a beep, a vibration, or both, and you can set it to go off for 1 second, 5 seconds, or 10 seconds. It also works beautifully as a simple countdown timer. Its handiness isn't limited to workouts, either. Over the past week, I've used it several times in the kitchen (it's more accurate than my windup cooking timer) and every morning in the bathroom, where I turn it on right before stepping into the shower. While I have yet to make it out before the 5-minute alarm goes off, I'm usually pretty close, and it has definitely shortened my shower time (good for our water bill, the environment, and my skin). The only drawback I've found is that because I use it all over the house, I sometime lose track of where it is, despite the convenient waistband clip. Whoops, time's up. Gotta go! Pros: It's versatile, easy to use, and is a great way to accurately time workout moves. It also works beautifully as a kitchen or bathroom timer. Extra tip: You'll use it everywhere—during workouts, in the kitchen, in the bathroom. So get two.